China is increasing focused on addressing corruption in its domestic healthcare industry. Chinese leader Xi Jinping’s anti-corruption campaign has swept through the country like a brushfire in a dry season. Banks, government officials, even newspaper reporters have all been targeted by Beijing. Lately, the government has increased scrutiny of corruption in China’s vast healthcare system – and multinationals eager to do business in the world’s fastest growing healthcare market should watch carefully. Recently, China’s National Health and Family Planning Commission (NHFPC), formerly the Ministry of Health, has issued three Circulars regarding anti-corruption and anti-bribery issues in the healthcare sector. Circular 49 listed nine forbidden actions by healthcare institutions and healthcare professionals. Circulars 50 and 163 revised the PRC’s blacklisting rules for commercial bribery in the healthcare industry, regulating the procurement of medicine, medical devices and medical supplies. These restrictive rules targeting the pharmaceutical and medical device industries by the NHFPC are a clear signal that domestic healthcare companies — along with multinationals — must comply with China’s domestic anti-corruption rules and relevant laws. These include the U.S. Foreign Corrupt Practices Act (FCPA) and the U.K. Bribery Act 2010. Chinese regulators are likely to pass more rules and actively take enforcement actions against bribery. However, there could also be a backlash. The enforcement agencies will encounter challenges regarding due process and fairness when blacklisting a non-compliant healthcare company and its distributors. These healthcare rules come on top of an increasingly strict crackdown on corruption reaching into the senior levels of the government. Roderick Macfarquhar of Harvard University has argued that the campaign is so serious it could bring the country to a political standstill. In his view, once you add in family members, the 87 million Party members at risk of anti-corruption measures becomes closer to 300 million people, threatening a large part of China’s population. In healthcare, the rising corruption is part of a longstanding decline in government payments for healthcare. From 1980 to 1999, the central government’s share of national healthcare spending as a percentage of total healthcare expenditure fell from 36 percent to 15 percent. The central government’s share in total government expenditure on healthcare fell from 8 percent to 4 percent. Meanwhile, Beijing forced hospitals to keep prices low and the markup on services no higher than 15 percent. That forced hospitals to make up the difference with equipment or service fees – an invitation for graft. Two years ago the easy marks for anti-corruption investigators were foreign companies. Most visible was GlaxoSmithKline’s $490 million in fines in 2014. Now, the focus has shifted to Chinese firms. The recent anti-corruption campaign in healthcare industry differs from the 2014 scandals in three ways. First, the targets have shifted from giant companies such as GSK and Roche to domestic players in the healthcare food chain, including hospital construction and real estate development. Examples include the arrest of the president of Hainan Sanya People’s hospital, who in March was sentenced to ten years in jail for bribery connected with bidding for a construction project. Second, there have been new audits of senior hospital officials, healthcare policy makers, and government officers. 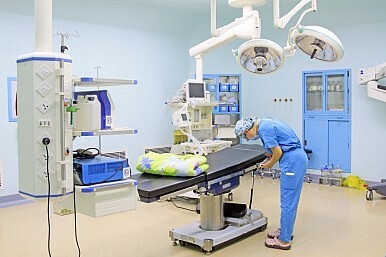 For example, in June last year the China Medical Association was criticized for accepting sponsorship from corporations. Finally, the current anti-corruption campaign has a local focus. Local and state-owned pharmaceutical company compliance systems are being closely examined as they are responsible for more than 65 percent of government hospital purchases. We think the heightened scrutiny of healthcare corruption will result in changes in China’s healthcare industry. Resources could flow from hospitals in the big cities to smaller clinics and county hospitals. There could be delays in procurement of large-scale equipment and facilities as officials avoid making politically difficult decisions. And buyers increasingly will favor Chinese over international brands. Expediting healthcare reform in China will be the key to solving the bribery challenges in the industry. Specifically, the government should allocate medical resources more evenly in the cities, suburban, and rural areas, encourage the establishment of private hospitals and pharmacies, promote private insurance plans to relieve the cost burden for patients, hospitals, and government, and increase doctors’ salaries to match their education and experience. The Chinese regulators should also reconsider their blacklisting models, understand U.S. suspension and debarment regulations, and develop a discretionary mechanism when adjudicating misconduct of non-complaint companies. A discretionary mechanism will provide more incentives for a rule-breaking company to cooperate with the government agencies, improve its misconduct, and implement a better internal compliance program. Andrew Collier is Managing Director and Vivienne Cheung is an analyst with the independent research and due diligence firm, Orient Capital Research in Hong Kong.